TOP Motor paraglider experience (Tandem) ! Anytime throughout the year ! A motor paraglider is a flight vehicle which can take off from the ground with little man power required. No experience is needed. This tandem (an instructor + one customer) motor paraglider flight will give you unforgettable spectacular view !! An early morning flight is recommended. Chances of good flying weather are twice as better as that in the afternoon. 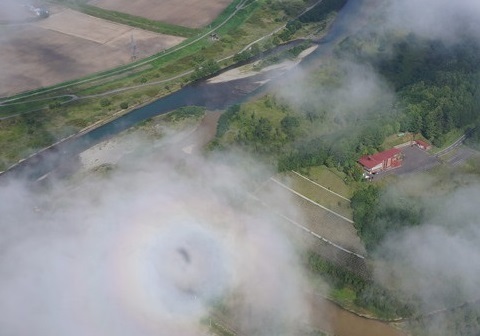 You may have a chance to go above the clouds! 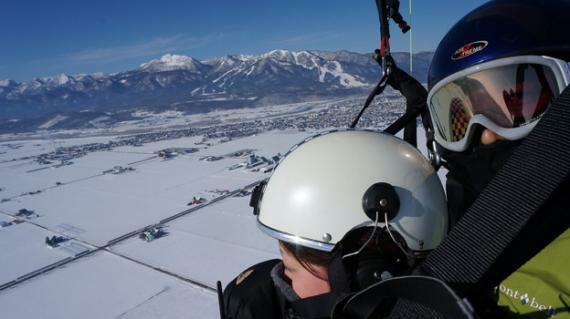 Enjoy the flight with an experienced instructor ! * Scheduled starting time 8:00 am(winter 9:00 am) to 4:00 pm. It is not acceptable from 12:00 am to 1:00 pm. Please provide 3 starting times in order of preference when you book. * Make sure be on site (meeting place) at least 20 minutes before your flight. * Starting/ending time may change due to wind conditions. Please be aware that you may have to wait for a couple of hours for good winds. Each participant is required to declare their weight when booking. Comfortable clothes and shoes (long sleeved shirt and long pants are recommended even during summer). It is located near JR Gakuden train station. It takes about 10 min from JR Furano train Station by taxi. * It takes about 6 min by walk from JR Gakuden train station. * It takes about 10 min by car from JR Furano train station. Please come to our office(140-1　2-ku Nishi Gakuden Furano) directly. * You are required to fly with a tandem motor paraglider instructor. * Please be aware that your flight may be cancelled or delayed due to weather conditions. * Please note that the success rate of making a scheduled flight is about 50%. This rate can increase if you have enough time to wait for good weather. * Opening hours is 8:00 ( 9:00 in winter) to 16:00 (except 12:00 to 13:00). * Do not take anything that you might drop. It is hazardous to other people on the ground. Only camera or glasses with secure neck straps are allowed. * Ideal weight for flight is from 40 kg to 70 kg due to the maximum horse power of tandem motor. * We ask customer to sign "Waiver agreement" on that day. A cancellation fee shall be charged if you cancel booking less than 2 days prior to the scheduled flight for reasons other than poor weather. No fee will be charged if there is no flight due to weather. 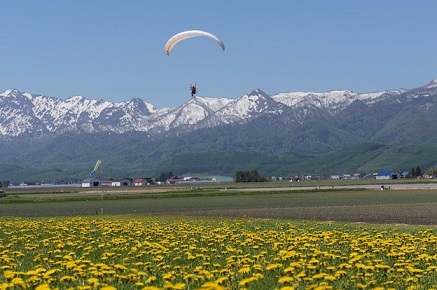 We run not only a snowkiting program but a motor paraglider school in the Furano area.